The competition for the 2017 African Responsible Tourism Awards has moved into the second round, with over 30 tourism organisations competing for top spots at the awards ceremony at WTM Africa in April. This year, the longlist names tourism organisations from Mozambique, Kenya, Tanzania, Zimbabwe, Ethiopia, South Africa, Botswana and Namibia. Longlisted organisations compete in seven categories, among them habitat and species conservation, engaging people and culture, poverty reduction and a new category in 2017 - the best responsible event. “The quality of entries which have made it through to the longlist this year confirms the power of responsible tourism as a force for good in Africa. 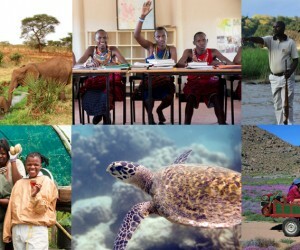 Each and every one of these organisations is playing an important role in championing responsible tourism. We’ve reviewed the information from the first round entry forms, and are excited about the possibilities,” says Heidi van der Watt, founder of the African awards and director of Better Tourism Africa. "The field for the 2017 African Responsible Tourism Awards (ARTA) is even stronger than previous years – and that takes some doing! Those longlisted have been invited to complete a detailed questionnaire, we'll take up references and make some inquiries. On judging day we'll identify those that demonstrate the difference that taking responsibility can make, and have the capacity to educate and inspire others to be more responsible." The general public can also offer support or otherwise for longlisted organisations by emailing talktous@africanresponsibletourismawards.com. Based on all the evidence, the independent judging team, made up of industry experts, will debate the entries and select the shortlist and winners. The shortlist will be announced on 7 April 2017. The 2017 African Responsible Tourism Awards winners will be announced at a ceremony that will be held on Thursday 20 April 2017 at the Cape Town International Convention Centre. The ceremony is part of the responsible tourism programme at WTM Africa, which takes place from 19 to 21 April 2017.